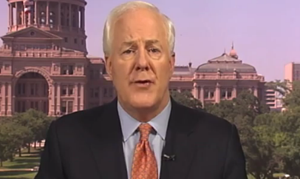 U.S. Sen. John Cornyn (R-TX) delivered the following weekly Republican address. “Hello, I’m Texas Senator John Cornyn. “As the 2012 election campaign heats up, rather than hope and change, President Obama has opted for fear and envy, and the Democratic Senate Majority Leader Reid is scheduling political show votes. Meanwhile, millions of American workers remain unemployed, and our biggest national problems loom large without the leadership Americans deserve. “Make no mistake: every single working American will see his or her taxes go up on January 1st absent action. Family budgets will be squeezed even tighter. Disposable income will shrink. And many jobs will be destroyed. “This would be a body blow for our economy and it could easily push us back into a recession. Everyone knows that, including the President, who seems to prefer campaigning to governing, demonstrating a disappointing unwillingness to lead. “Since President Obama took office, millions of households across the country have seen their income shrink, while the cost of health care, food, and gasoline have greatly increased. And yet the President still seems to think that there’s nothing wrong with our economy that a tax increase on job creators won’t solve. “The resulting uncertainty over federal taxes has been deeply harmful to our economic recovery. After all, if you’re a business owner, why would you hire new employees or make substantial investments if you don’t know what your tax rates will be on January 1st? Why would you expect the economy to improve when President Obama has repeatedly indicated his belief that the problem is not that the federal government spends too much but that taxes are too low? “Raising taxes is the last thing we should do amid the weakest economic recovery since World War II. Unfortunately, even if we avoid the full ‘Taxmageddon’ scenario, President Obama’s health care law also contains a new surtax on investment that will take effect in 2013. This new surtax will hamper small business investment, which is the lifeblood of private-sector job creation. “I would remind the President that, back in 2010, 47 House Democrats signed a letter that said, ‘Raising taxes on capital gains and dividends could discourage individuals and businesses from saving and investing.’ That was true in 2010, and it’s true in 2012. “The good news is that we now have an emerging bipartisan consensus on tax reform. The bad news is that President Obama is missing in action. The bipartisan consensus is simple: We should lower the rates and broaden the base. That would make our tax system more logical, more efficient, and more conducive to strong economic growth. “But we won’t get real tax reform until we get real Presidential leadership. The time for action is now. The longer that President Obama dithers, the greater the harm to our economy. “Republicans have made clear our position: We’re eager to prevent the largest tax increase in American history, and we don’t see any reason for delay. We sincerely hope the President will work with us to save jobs, protect family incomes, and strengthen the economy. “That’s what most Americans want, and that’s what they deserve.